Go here for more about Roosevelt's Lend-Lease Press Conference. 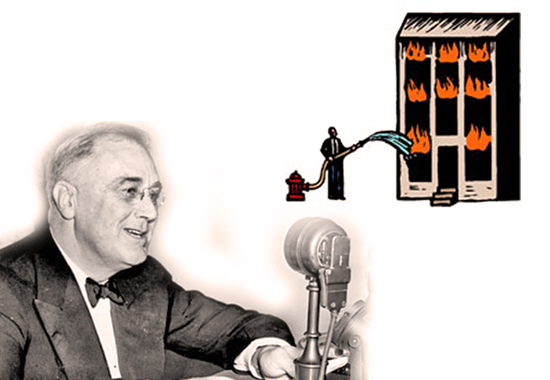 It follows the full text transcript of FDR's Lend-Lease Press Conference, delivered at the White House in Washington D.C. - December 17, 1940. THE PRESIDENT: When I came back yesterday I began to note intimations that this inaugural party was getting out of hand—all these chairmen, et cetera, trying to make a real party out of it, and I was trying not to. In other words, simplicity, I still think, should be the keynote; and I am trying to catch up and find out what people have been doing while I was away. Outside of that I have been trying to catch up on quite a number of other things. I don't think there is any particular news, except possibly one thing that I think is worth my talking about. In the present world situation of course there is absolutely no doubt in the mind of a very overwhelming number of Americans that the best immediate defense of the United States is the success of Great Britain in defending itself; and that, therefore, quite aside from our historic and current interest in the survival of democracy, in the world as a whole, it is equally important from a selfish point of view of American defense, that we should do everything to help the British Empire to defend itself. I have read a great deal of nonsense in the last few days by people who can only think in what we may call traditional terms about finances. Steve [Mr. Early] was asking me about it this morning, and I thought it was better that I should talk to you than for Steve to talk to you; but I gave him one line which he would have used this morning if anybody had asked him, and that was this: In my memory, and your memory, and in all history, no major war has ever been won or lost through lack of money. I remember 1914 very well, and I will give you an illustration: In 1914 I was up at Eastport, Maine, with the family the end of July, and I got a telegram from the .Navy Department that it looked as if war would break out in Europe the next day. Actually it did break out in a few hours, when Germany invaded Belgium. So I went across from the island and took a train down to Ellsworth, where I got on the Bar Harbor Express. I went into the smoking room. The smoking room of the Express was filled with gentlemen from banking and brokerage offices in New York, most of whom were old friends of mine; and they began giving me their opinion about the impending world war in Europe. These eminent bankers and brokers assured me, and made it good with bets, that there wasn't enough money in all the world to carry on a European war for more than three months-bets at even money; that the bankers would stop the war within six months—odds of 2 to 1; that it was humanly impossible-physically impossible- for a European war to last for six months—odds of 4 to 1; and so forth and so on. Well, actually, I suppose I must have won those- they were small, five-dollar bets— I must have made a hundred dollars. I wish I had bet a lot more. There was the best economic opinion in the world that the continuance of war was absolutely dependent on money in the bank. Well, you know what happened. Now we have been getting stories, speeches, et cetera, in regard to this particular war that is going on, which go back a little bit to that attitude. It isn't merely a question of doing things the traditional way; there are lots of other ways of doing them. I am just talking background, informally; I haven't prepared any of this—I go back to the idea that the one thing necessary for American national defense is additional productive facilities; and the more we increase those facilities—factories, shipbuilding ways, munition plants, et cetera, and so on—the stronger American national defense is. Orders from Great Britain are therefore a tremendous asset to American national defense; because they automatically create additional facilities. I am talking selfishly, from the American point of view—nothing else. Therefore, from the selfish point of view, that production must be encouraged by us. There are several ways of encouraging it—not just one, as the narrow-minded fellow I have been talking about might assume, and has assumed. He has assumed that the only way was to repeal certain existing statutes, like the Neutrality Act and the old Johnson Act and a few other things like that; and then to lend the money to Great Britain to be spent over here—either lend it through private banking circles, as was done in the earlier days of the previous war, or make it a loan from this Government to the British Government. Well, that is one type of mind that can think only of that method somewhat banal. There is another one which is also somewhat banal—we may come to it, I don't know—and that is a gift; in other words, for us to pay for all these munitions, ships, plants, guns, et cetera, and make a gift of them to Great Britain. I am not at all sure that that is a necessity, and I am not at all sure that Great Britain would care to have a gift from the taxpayers of the United States. I doubt it very much. Well, there are other possible ways, and those ways are being explored. All I can do is to speak in very general terms, because we are in the middle of it. I have been at it now three or four weeks, exploring other methods of continuing the building up of our productive facilities and continuing automatically the flow of munitions to Great Britain. I will just put it this way, not as an exclusive alternative method, but as one of several other possible methods that might be devised toward that end. It is possible—I will put it that way—for the United States to take over British orders, and, because they are essentially the same kind of munitions that we use ourselves, turn them into American orders. We have enough money to do it. And thereupon, as to such portion of them as the military events of the future determine to be right and proper for us to allow to go to the other side, either lease or sell the materials, subject to mortgage, to the people on the other side. That would be on the general theory that it may still prove true that the best defense of Great Britain is the best defense of the United States, and therefore that these materials would be more useful to the defense of the United States if they were used in Great Britain, than if they were kept in storage here. Now, what I am trying to do is to eliminate the dollar sign. That is something brand new in the thoughts of practically everybody in this room, I think—get rid of the silly, foolish old dollar sign. Well, let me give you an illustration: Suppose my neighbor's home catches fire, and I have a length of garden hose four or five hundred feet away. If he can take my garden hose and connect it up with his hydrant, I may help him to put out his fire. Now, what do I do? I don't say to him before that operation, "Neighbor, my garden hose cost me $15; you have to pay me $15 for it." What is the transaction that goes on? I don't want $15—I want my garden hose back after the fire is over. All right. If it goes through the fire all right, intact, without any damage to it, he gives it back to me and thanks me very much for the use of it. But suppose it gets smashed up—holes in it—during the fire; we don't have to have too much formality about it, but I say to him, "I was glad to lend you that hose; I see I can't use it any more, it's all smashed up." He says, "How many feet of it were there?" I tell him, "There were 150 feet of it." He says, "All right, I will replace it." Now, if I get a nice garden hose back, I am in pretty good shape. In other words, if you lend certain munitions and get the munitions back at the end of the war, if they are intact haven't been hurt—you are all right; if they have been damaged or have deteriorated or have been lost completely, it seems to me you come out pretty well if you have them replaced by the fellow to whom you have lent them. I can't go into details; and there is no use asking legal questions about how you would do it, because that is the thing that is now under study; but the thought is that we would take over not all, but a very large number of, future British orders; and when they came off the line, whether they were planes or guns or something else, we would enter into some kind of arrangement for their use by the British on the ground that it was the best thing for American defense, with the understanding that when the show was over, we would get repaid sometime in kind, thereby leaving out the dollar mark in the form of a dollar debt and substituting for it a gentleman's obligation to repay in kind. I think you all get it. Q. Mr. President, that suggests a question, all right; Would the title still be in our name? THE PRESIDENT: You have gone and asked a question I have told you not to ask, because it would take lawyers much better than you or I to answer it. Where the legal title is would depend largely on what the lawyers say. Now, for example, if you get mixed up in the legal end of this, you get in all kinds of tangles. Let me ask you this simple question: You own, let us say, a house, a piece of property, a farm, and it is not encumbered in any way—there is no mortgage on it rebut you have had some troubles, and you want to borrow four or five thousand dollars on it. You go to the bank and you say, "I want to borrow four or five thousand dollars on my house or my farm." They say, "Sure; give me a mortgage." You give them a mortgage, if you think you will be able to pay it off in three or four years. In your mind you still think you own your own house; you still think it is your house or your farm; but from the strictly legalistic point of view, the bank is the owner. You deed your house over to the bank; you pledge it, like going to the pawnbroker. Let's take the other side of it: The title to your gold watch is vested in the pawnbroker. You can redeem it; you can pay off your mortgage and get title to your house. On this particular thing—let's say it's a ship—I haven't the faintest idea at this moment in whom the legal title of that particular ship would be. I don't think that makes any difference in the transaction; the point of the transaction is that if that ship were returned to us in first-class condition, after payment of what might be called a reasonable amount for the ship during that time—the other people might have had a legal title or the title might have remained in us; I don't know, and I don't care. Q. Let us leave out the legal phase of it entirely; the question I have is whether you think this takes us any more into the war than we are? THE PRESIDENT: No, not a bit. Q. Even though goods that we own are being used? THE PRESIDENT: I don't think you go into a war for legalistic reasons; in other words, we are doing all we can at the present time. Q. Mr. President, did you mean naval craft? THE PRESIDENT: No, no! I am talking about merchant ships. Q. It is my understanding that this is all for purposes of background, but at one point here I was wondering whether you would attribute this to the necessity for facilities and for encouragement of production? THE PRESIDENT: I think you can attribute this—what we have been talking about— to me. Q. Mr. President, would we take our own goods abroad? THE PRESIDENT: What do you mean—take our own goods? Q. As long as this is being made to our account and we are lending it to Great Britain, would we deliver the goods in Great Britain that are going to be used in that way? THE PRESIDENT: Oh, I suppose it would depend on what flag was flying at the stern of the ship. You can work it out any way you want. It might be even a Bolivian flag. That question is a detail. Q. Would it be an American flag? THE PRESIDENT: Not necessarily. That would bring up another subject; that would bring up a subject which might be a dangerous one, quite frankly, of American sailors and American passengers, et cetera, taking the American flag into a war zone. You need not worry about that one bit, because you don't have to send an American flag and an American crew on an American vessel. Q. I was backing into the question that this whole theory of yours doesn't involve amendment of the Neutrality Act. Q. You referred to future orders in this connection; as I understand it, the orders the British have given would go ahead on the basis of existing contracts and would be paid for? THE PRESIDENT: Yes, I think so. They have plenty of exchange, you know. There doesn't seem to be very much of a problem about payment for existing orders, but there might be a problem about paying for additions to those orders or for replacement of those orders now. Q. Is this a safe conclusion on what you have said, that what the British are interested in is to have us lend them the supplies? THE PRESIDENT: That's the point. I am trying to eliminate the dollar mark. Q. Does this require Congressional approval? THE PRESIDENT: Oh, yes, this would require various types of legislation, in addition to appropriation. Let me give you an example: Let's take anything—a shell factory; and the present shell factories are all filled up with orders a year-two years—ahead; but the British need more shells now, and the shell manufacturers say, "that is all very well, but we have got to get a new factory." And the United States Government has ordered several new factories and put up the money through the R.F.C. or some other way for the capital. Well, if the British wanted a new factory for additional shells, or went above present orders, if we take that order over we would do the financing of the factory just the way we have done it for ourselves, thereby increasing the productive capacity for turning out shells. Q. Mr. President, before you loan your hose to your neighbor you have to have the hose. I was wondering, have you any plans to build up supplies? There has been a good deal of discussion about lack of authority to tell a manufacturer he should run two or three shifts a day. There is no one now that has that authority. Q. I don't believe so. THE PRESIDENT: I think so, yes. After all, you have to follow certain laws of the land. Of course the law is, and always was that contracts by the Navy, for instance (I used to place a great many of them in the World War) —should be signed by the Secretary of the Navy or the Assistant Secretary of the Navy. Never, in the history of the United States, has that power been taken away from the two main contracting departments. That is a pretty important thing to remember. A lot of people in the last week or two have forgotten that fact. There never has been one individual in this country, outside of the Army or Navy, who could do anything more than recommend very strongly that they do thus and so, and supervise it—supervise keeping the program up to date. If the program is not kept up to date, there are lots of things that have been done in the past, and would be done in the future. That is what was done in the World War. The number of perfectly crazy assertions that have been made in the last couple of weeks by some people who didn't grow up until after the World War is perfectly extraordinary. They have assigned all kinds of authorities and powers to people in the World War that never existed, except in the figment of their imagination. I went through it; I happen to know. Q. Mr. President, on your statement that we never would get into war for legalistic reasons—would you amplify that a little? THE PRESIDENT: Only this, that I would not try, from what I have said, to make it appear—who was it who asked that question a while ago? THE PRESIDENT: Jim Wright asked whether any of these steps would be a greater danger to the United States of getting into war than the existing situation, and the answer is: "No, of course not." In other words, we are furnishing everything we possibly can at the present moment. This will make easier a continuation of that program. That's all there is to it. Q. Mr. President, it is interesting about taking over the future orders for the British, but Mr. Knudsen says that the first half of that is crucial. Can you do anything more than you are doing? THE PRESIDENT: Except efficient people; that's what he is trying to do—push them. Q. Mr. President, has the division of orders been changed? It was 50-50 the last time. THE PRESIDENT: That was a rule of thumb. In some places it is 40-60, and in others 60-40. Q. Mr. President, do any production delays at the present time indicate any need for authority to take over plants? THE PRESIDENT: That is a thing I asked Steve [Mr. Early] to lookup this morning. MR. EARLY: No one is reporting today, sir. THE PRESIDENT: That is a thing I asked Steve to report on. No one reported today. But I think it is fair to say there are two or three companies under investigation. Q. Mr. President, do you expect to place this general idea before this session of Congress? THE PRESIDENT: Either that or something similar. Q. Within a few days? THE PRESIDENT: No, probably not until the 3rd, because the thing has not only to be worked out here, but in London too. Q. Mr. President, is there any plan under consideration for building up our Defense Program because of this? THE PRESIDENT: Well, that's a pretty general question; on what, for example? Q. I wondered if you had any specific program for building up any phase of defense. THE PRESIDENT: You can't answer a general question like that. If you ask about an article that is coming along in good shape, the answer is No. It depends on what you are talking about. Before I left, I think we talked about the Navy destroyer program which, in my judgment, was completely insufficient because a lot of the planned destroyers could not be laid down except in turn. In other words, after No. 1 Destroyer had been built and launched from the ways, then they would start No. 31 of the destroyers on the same ways, build that and launch it, and after that was launched they would put No. 61 on the same ways, so that No. 61 would not be launched for perhaps four years from now. Well, now, the answer to that program, which was laid down by the Navy Department, was that in my judgment it was too darned slow. And how can you speed it up? By building more ways. So that was an illustration of how the program as laid down proved insufficient, and we are now studying how we can build more destroyer ways. Q. Mr. President, Mr. Knudsen said the whole Defense Program was lagging pretty severely; do you see anything in this picture that would require you to extend the present limited emergency? THE PRESIDENT: No; that again is largely a legalistic problem. It is a great question whether it would speed it up or not—a great technical question. Q. Mr. President, when the Government refuses to take in a union man on a defense project, don't you think it is because the unions ask exorbitant fees? THE PRESIDENT: You would have to give me the name of the man and information about the case. Q. How about eliminating the Friday to Monday blackout? THE PRESIDENT: It depends entirely on the particular type of industrial plant and the conditions in the locality, and the type of workmen that are used. There is no generalization that is possible; and the one thing we have to avoid, all of us, is generalization. Now for example- you take down here in the Washington Navy Yard, there are certain very, very skilled trades; and there is a shortage of labor in those trades. Because there is a shortage, because there is no relief, no additional labor in that trade, we probably have to employ the people in that particular trade, more than 40 hours; and for the extra hours they will get time and a half for overtime. You take the other extreme— common labor; there's plenty of it. For common labor it is not necessary in that particular yard to work men overtime; and yet you can run the yard six days a week, or even seven days a week. It takes a lot more planning on the part of management to work it out, but you can employ one group of common laborers the first five days in the week, 40 hours—that is, 8 hours a day; and then another group you can employ on Tuesday, Wednesday, Thursday, Friday and Saturday and give them Sunday and Monday off; and another group you can employ Wednesday, Thursday, Friday, Saturday and Sunday and give them Monday and Tuesday off; and in that way you can keep a plant going seven days a week if you want to. It takes a little more-what shall I say?—figuring out on a sheet of paper, a little more trouble. In that way some people will get their holiday in the middle of the week for a while, and others will get it at the end of the week; but it can be done, and it is being done-that is the point of it—in a great many plants in the United States. It is being done; and that can be extended to a great many other plants. It is a nuisance from the point of view of plant management; we all know that. There is still another point to consider—there are plants which obviously could not run seven days a week; the plant that has to be laid up for repairs one day out of seven; or a part of a particular plant that has to be laid up for repairs and closed down one day out of seven. You see you can't apply a general rule. It's just plain immature to try to do it. The people that understand manufacturing will be the first to say you can't apply a general rule to this question. Q. Mr. President, one argument that is advanced is where it is necessary for a man to work 55 hours a week, a trained man, and he can't be replaced; and since the public is begging for this armament, that is putting undue stress on the public's shoulders—time and a half. THE PRESIDENT: In the case of that particular man that is irreplaceable working 55 hours a week, we are trying, as you know, to train other people to fit into those positions. It takes time to do it, but gradually we are getting a large number of people trained to do these specialized jobs. Q. Mr. President, on this defense setup, do we understand you to mean that you are not interested in appointing a chairman of the national defense? THE PRESIDENT: I would not draw any inferences on a detail. That is a pure detail. Q. One more question: I believe Mr. Knudsen referred to the blackout of machine time rather than human time. I believe he was referring quite specifically to the fact that the machines were shut down between Friday and Monday. THE PRESIDENT: You have to tell me the machine, and the trade that runs the machine. THE PRESIDENT: In some cases, yes; in some cases, no. The objective is to keep all the machines that will run seven days a week in operation seven days a week.